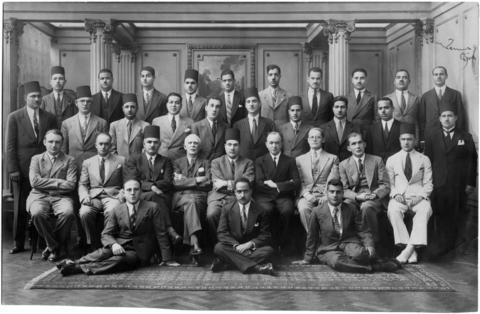 Note on the back of the photograph suggests that it is a photograph taken at Cairo University in the 1920s, and lists the people seated left to right as: 1. [? ], 2. [? ], 3. Selim Hassan 4. Newberry 5. [?] 6. Junker 7. Vikentiev 8. Henri? Frankfort 9. [?] and in the front row 1. Baudouin? Van de Walle, 2. [? ], 3. [? ].